LE SUEUR, PIERRE, donné of the Jesuits, explorer, trader, coureur de bois; b. c. 1657 in Artois, France, son of Victor Le Sueur and Anne Honneur; d. 17 July 1704 at Havana, Cuba. While still a youth, Le Sueur came to Canada under the auspices of the Jesuits, who sent him as a donné to their mission at Sault Ste Marie. The lure of the fur trade was too great for the youth to resist, and in 1680 he was denounced as a coureur de bois. He was soon involved in trade with the Sioux on the upper Mississippi, became thoroughly schooled in frontier life, and was popular among the Indians. 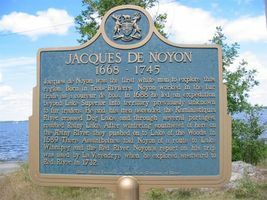 On 12 Sept. 1682, in Montreal he entered into an agreement with others for a voyage to Michilimackinac. In 1689 he was at Fort Saint-Antoine when Nicolas Perrot proclaimed the French king’s sovereignty over the area of the upper Mississippi. Le Sueur married, in 1690, Marguerite, daughter of Michel Messier and a relative of Pierre Le Moyne d’Iberville; they had a son and four daughters. 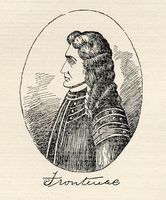 Despite the opposition of Bochart de Champigny, who regarded him as little more than Buade* de Frontenac’s ally in the fur trade, Le Sueur obtained in 1693 from Frontenac a commission to reopen the routes from Lake Superior to the Mississippi, to build a post at La Pointe (Chequamegon Bay), to maintain peace between the Chippewas and the Sioux, and to protect the latter from attacks by their enemies, the Foxes and Mascoutens. Le Sueur was undoubtedly a successful trader, but his knowledge of the Sioux and Chippewa languages and his familiarity with the geography of the upper Mississippi enabled him also to play a role in Indian diplomacy. In the summer of 1695 he returned from the west, bringing with him a great Sioux chief to make an alliance with Frontenac, and a Chippewa chief who ratified peace between the two nations. The Sioux died in Montreal. It was probably early in 1697 that Le Sueur presented a report to the king proposing a permanent post among the Sioux. He mentioned the advantages of copper and lead mines in the area, the lucrative fur trade, and the availability of wood for construction purposes; he suggested that he be appointed commandant at La Pointe with exclusive trading rights for ten years and with permission to take arms to the Sioux; he requested a guard of 20 men for the fort and an equal number for mining. Le Sueur’s proposals were opposed; the Illinois were against the giving of arms to their enemies, the Sioux, and the officials in New France claimed that Le Sueur’s request for mining privileges was but a pretext for trading. Undaunted, Le Sueur went to France in 1697 and finally obtained permission to take 50 men with him into Sioux country to open mines and engage in limited trade; he was specifically forbidden to trade in beaver. He formed a company, but misfortune dogged him. Champigny railed against the grant to Le Sueur: “I think the only mines that he seeks in those regions are mines of beaver-skins.” It is possible that, during his stay in Paris, Le Sueur communicated the results of his explorations of the Mississippi to the cartographer, Franquelin. It is difficult to trace Le Sueur’s movements during the next two years but he returned to France at least once. In 1697 he had been captured by the English but was later released. At the French court his fortunes varied according to changes in official policy: the trading permit granted him on 21 May 1698 was revoked on 27 May 1699, when it was decided to abandon trade with the Sioux because of Fox opposition. While in France Le Sueur gave information to Guillaume Delisle which was incorporated into one of his maps. The antagonism of the officials in New France blocked Le Sueur’s way until 1699. In that year, with the support of his wife’s relative, Iberville, who no doubt expected Le Sueur to be of considerable service in the organization of the Louisiana trade, he obtained royal permission to undertake an expedition from the colony to the Sioux country to exploit mines. 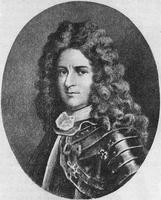 Le Sueur now formed a compagnie des Sioux, of which Iberville and the farmer-general Alexandre L’Huillier were members. He recruited men and artisans at La Rochelle and accompanied Iberville on his second expedition to Louisiana. They arrived at Biloxi in January 1700. Later that year, with over a dozen men including the carpenter Pénigaut, Le Sueur started up the Mississippi. He reached the mouth of the Rivière Saint-Pierre (Minnesota) on 19 September and continued up it to the Rivière Verte (also called Rivière Bleue, now Blue Earth River). There he built Fort L’Huillier. The following spring Le Sueur left a detachment of men under Éraque at the fort, and returned to Mobile with a cargo of furs and minerals. His activities during this period, particularly his open disregard of the prohibition against the beaver trade, further irritated the authorities in New France and led to a fresh series of accusations by Callière. In April 1702 Le Sueur returned to France with Iberville. Le Sueur gave an account of his expedition to the minister and showed his caissons of minerals. He presented a mémoire summarizing his activities during a 15-year period of exploring the upper Mississippi. He now asked for a commission as judge at newly established Mobile, permission to employ men in further discovery work, a substantial salary, and the transportation of his family to Louisiana. Iberville supported these requests for he still wanted to use Le Sueur to win a share of the Mississippi Valley trade for Louisiana, at the expense of both Canada and the English colonies if necessary. Although Pontchartrain denounced Iberville’s projects and also those of Le Sueur, the king appointed the latter judge at Mobile, permitted him to recruit men for exploratory purposes, and agreed to pay him for his work among the Sioux and Illinois. Le Sueur was supposed to leave France on the Loire in 1703 but he did not actually sail until the spring of 1704 aboard the Pélican. The ship, which was carrying nurses and women to Louisiana, stopped at Havana where Le Sueur contracted yellow fever. He had to be left behind and, after drawing up his will, he died on 17 July and was buried in the parish church of San Cristóbal. His wife had applied for permission to go with her children to Louisiana. This was granted in a royal mémoire to Rigaud de Vaudreuil dated 14 July 1704. Madame Le Sueur reached Mobile in April or May 1705 and did not hear of her husband’s death until her arrival in Louisiana. Their son, Jean-Paul, may have been the Le Sueur, known as “the Canadian,” who was later active with Le Moyne* de Bienville against the Natchez. Pierre Le Sueur helped to arouse French interest in the discovery of mines and contributed in an important way to the cartography of the upper Mississippi region. His connection with Frontenac and later with Iberville in Louisiana made him a controversial figure in the political and commercial rivalries of his day. Le Sueur’s “Mémoires” (extracts of letters and notes on conversations with him by Guillaume Delisle) are in AN, Marine, 2JJ, 56 (formerly Archives du Service Hydrographique de la Marine, 115x, no 9). Margry’s extracts from these “Mémoires” are in BN, MS, NAF 9296 (Margry), 47, published in Découvertes et établissements des Français (Margry), VI, 69ff. ; parts are translated in Wis. State Hist. Soc. Coll., XVI, 177ff. The most significant document in the “Mémoires” is a letter dated 4 April 1700; this takes the form of a journal beginning at La Rochelle, 16 Oct. 1699, and describing the journey to Louisiana and up the Mississippi (see BN, NAF 21395 (Arnoul), 5–13). Pénigaut incorporated Le Sueur’s narration into his own “Journal” which is printed in Découvertes et établissements des Français (Margry), V, 375–586. Several translations of parts of the Pénigaut journal have been made, but most satisfactory is the complete translation: Fleur de Lys et calumet: being the Pénicaut narrative of French adventure in Louisiana, ed. and tr. R. G. McWilliams (Baton Rouge, La., 1953). Guillaume Delisle’s “Carte de la Rivière de Mississipi, 1702,” based on the “Mémoires” of Le Sueur, is in BN, Cartes et plans, Portefeuille 1382, div.3, no. 2. An anonymous map, apparently illustrating Le Sueur’s voyage of 1700–1, is to be found at Service historique de la Marine (Paris), LXIX, 27. A. P. Nasatir, “LE SUEUR, PIERRE,” in Dictionary of Canadian Biography, vol. 2, University of Toronto/Université Laval, 2003–, accessed April 24, 2019, http://www.biographi.ca/en/bio/le_sueur_pierre_2E.html.